I’m not going to try to cover everything that was said at last week’s meeting at the Enmore Theatre. But there are a few points I do want to respond to. It was said that “the percentage of trips taken by car will not change”. However, Bureau of Transport Statistics show that in the decade to 2012, the population grew by 12%, car driver trips grew only 6%, while trips by bus and train increased by 16% and 23% respectively. It was said that if the M4-M5 Link is not built, the same amount of traffic “will still find a way through your area”. This flies in the face of research overseas and in Australia which consistently finds that adding extra roads encourages more traffic, while closing roads results in less traffic. It was said that work will not begin until the Environmental Impact Statement (the EIS) is approved. However, it was also said that contracts for the work will be signed before the EIS is approved. It was said that the exhaust stacks will be at the St Peters interchange, with all this implies for Sydney Park. It was said that Stage 3 will include a link to the airport. Up until now, the link to the airport was something that might happen after Stage 3. Up until now, the forecast price tag was $15 Billion dollars. A new major extension has been added to the project, but the forecast price tag is still $15 Billion dollars. It doesn’t add up. It was said that the cost to the public (you and me) will not be $15 Billion dollars because it will be paid for by tolls. The average toll is forecast to be $4.50. 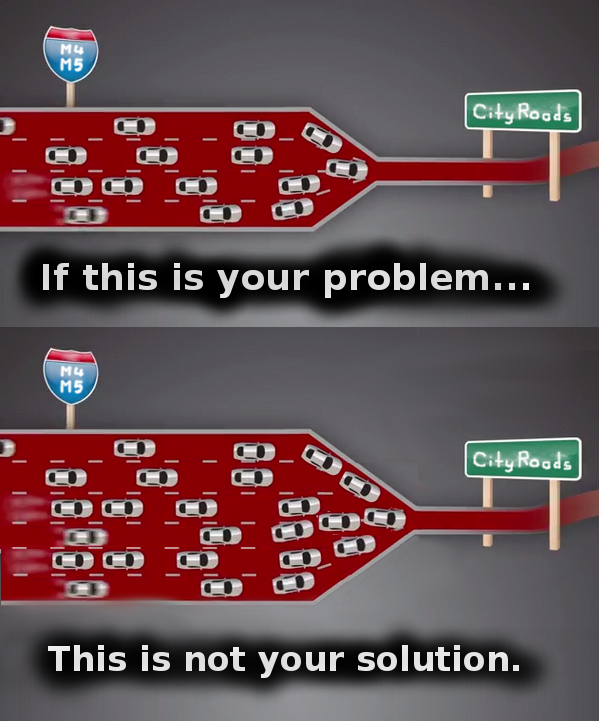 WestConnex is supposed to carry 300,000 vehicles per day. However, up to half of those vehicles will come off the M5,which means that they aren’t paying an extra $4.50, but only an extra dollar or two. The tolls collected won’t be more than $330 million a year. But the interest bill on $15 billion dollars will be more like $900 million a year. And that assumes that the traffic forecasts are accurate, something which has rarely been the case with Sydney tollways. It was said that the business case does not need to be made public because it will be reviewed by Infrastructure Australia (IA). IA has reviewed a version of the business case. IA has complained that the version of the business case given to them is based on a 50/50 chance of the project coming in under budget – IA normally want 90% confidence of a project meeting its budget. IA has also complained that the traffic modelling assumes that the forecast reduction in travel time won’t encourage more cars onto the road. Ignoring these two limitations, IA has “a high degree of confidence” that benefits will outweigh costs. When these two limitations are considered, IA only has “a degree of confidence” that benefits will outweigh costs. It was said that there are “no plans” to extend King Street Clearways. But there was no commitment not to develop such plans in the future. It was said that WestConnex will not “rip up Sydney Park”, the argument being that the 12 meter strip that forms one edge of Sydney Park is owned by the RMS. Obviously, the RMS has the legal right to reclaim this land, but to claim that somehow, this land isn’t part of Sydney Park as it is today, is missing the point. Whoever owns it, turning it into road will reduce Sydney Park, not just by the amount of land removed, but by inflicting car fumes and noise on the whole of the park. It was asked if adding extra lanes to Euston and Campbell Roads will make any difference, given that both roads will be back to one lane after a few hundred meters. The answer given was that detailed traffic studies are underway, and have been for 18 months. It was also said that such studies can take months or years, which raises the question of whether the modelling will be complete before the road opens. It was asked if St Peters was chosen for the interchange because the RMS already had road reservations and land, or because studies fortuitously indicated that it was the best location for the interchange? The answer was that the studies fortuitously indicated that the site was the best location. The follow-up question was: if the studies are done, why are you still doing the studies? There was no answer. We are sorry to announce this, but there will not be an Alexandria Summer Fair this year. Between responding to WestConnex, Central 2 Eveleigh, and the so called Planning Reforms, all of us volunteers are flat out. We just don’t have the bandwidth to organise the fair as well. We’re all really disappointed about this, but it was just one thing too many. We are aiming to hold the fair next year, hope to see you there! March State Election – what burning questions should we ask the candidates at our Meet the Candidates forum in March?